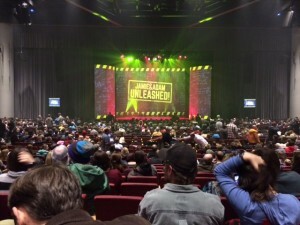 It was my daughter’s birthday recently, and she got her present last night: I took her to dinner, following which we went to see the Mythbusters farewell tour Denver show: Jamie & Adam Unleashed! We had pretty good seats, about half-way back and just left of center. Photography and recording during the show weren’t allowed (although this was widely ignored). The only photo I took was this one to show our view of the stage. We’d not seen them on any prior tours, so I had looked up the show reviews a couple of days earlier. I only saw one negative review, from someone who felt they showed too many videos. I disagree, personally. I had no problem with the number of videos shown, especially because several of them were provided with running commentary by Adam. One of them (a supercut of explosions with enhanced audio so that you could feel the explosions) was my daughter’s favorite part of the show. Personally, I thought the question and answer sessions (they each did one) were interesting, particularly finding out that Jamie has a degree in Russian linguistics with a minor in library science, and that Adam is a high school graduate. If I’d had the opportunity to ask a question (we were too far back to be chosen), I’d have asked one of two things: either what proportion of their research they did on their own compared to bringing in experts, or, given that Adam noted that he had been hired by Jamie a few years before the Mythbusters shows started, how he ended up as Jamie’s business partner. In any case, it was a very informative and enjoyable show. I’m glad we went. You are currently browsing the Wheels within Wheels blog archives for December, 2015.